I promised I would be back to show you the other card we made on Monday night. 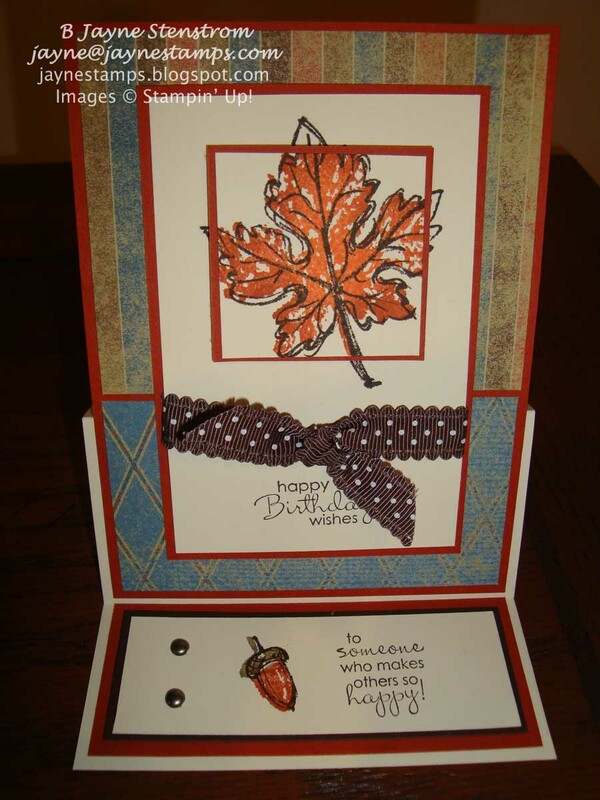 This is an easel card made with the Gently Falling stamp set. 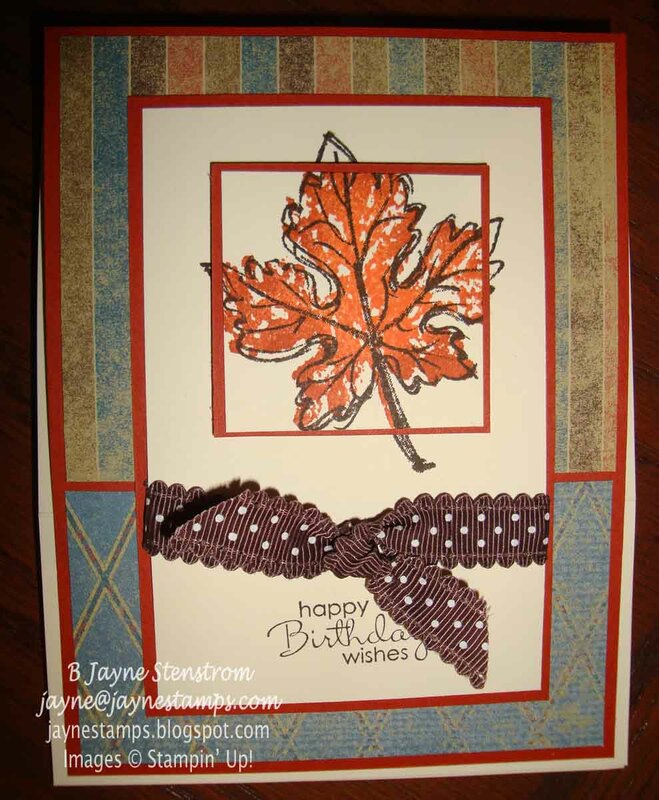 I really do love the leaves in this set - and I love that it's two-step stamping. 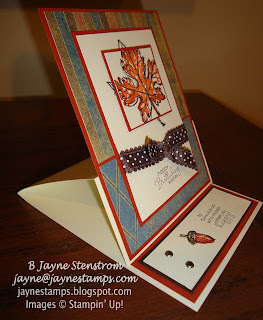 This is another card idea that I saw on Patty Bennett's blog. She had gotten together with Sharon Armstrong and they made a card very similar to this. This is the view with the card closed. 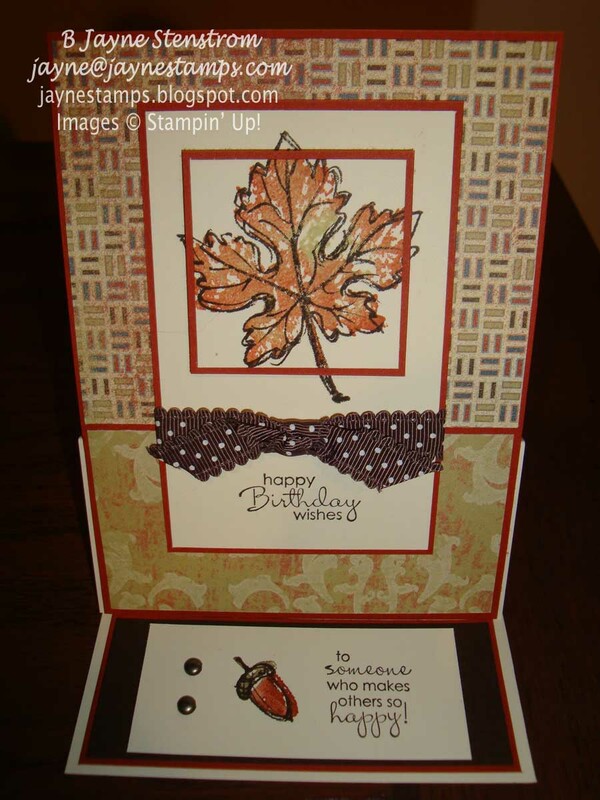 It fits in a standard Stampin' Up! Medium Envelope. 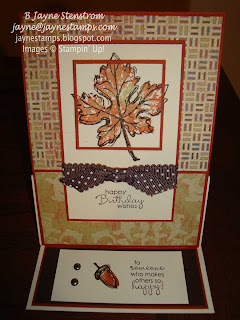 I've seen a lot of cards done with the Gently Falling stamp set and almost all of them use the colors in the Spice Cake Designer Series Paper that coordinates with it. But I wanted to mix it up a little bit, so I used some of the Well Worn DSP that I had. The leaf was inked up with Tangerine Tango and then I used a Sponge Dauber to add some Cajun Craze around the outside edges. The saying comes from Petite Pairs - a great word set to have! Here is the card propped open. This card is the same except that the choice of color in the DSP (still from the Well Worn pack) made it look softer. So I inked up the leaf with River Rock dye ink before sponging the edges with Cajun Craze. So do you like? We were all happy with ours and everyone said they had a great time getting together to stamp. Sometimes the "unplanned" gatherings are the most fun! I don't stress out about them because I haven't had a lot of time to prepare, so I just go with the flow.